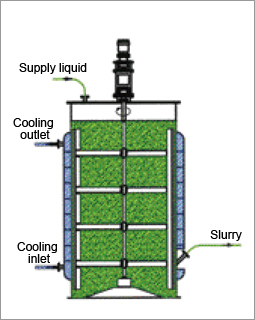 Jacket Scraping-Cooling Crystallizer | KATSURAGI INDUSTORY CO.,LTD.- Dryers,Drum Flakers,Concentrators,Crystllizers. 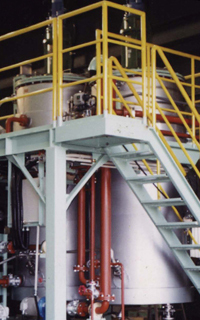 This crystallizer is used mainly for the materials of which solubilities are substantially reduced due to fall in temperature as in the case of aqueous sodium sulfate. For the materials of which crystals are apt to stick on the cooled surface, scraping vanes using reinforced Teflon are provided. This type is suited to the small-scale production because of the limited cooling area. However, throughput can be increased by introducing a multi-stage continuous system or arranging multiple batch tanks installed. This system, which is of course used for recovery of valuable matters, can display its power in recovery of mother liquor, not for crystals, because it is difficult to control the crystal grain size.